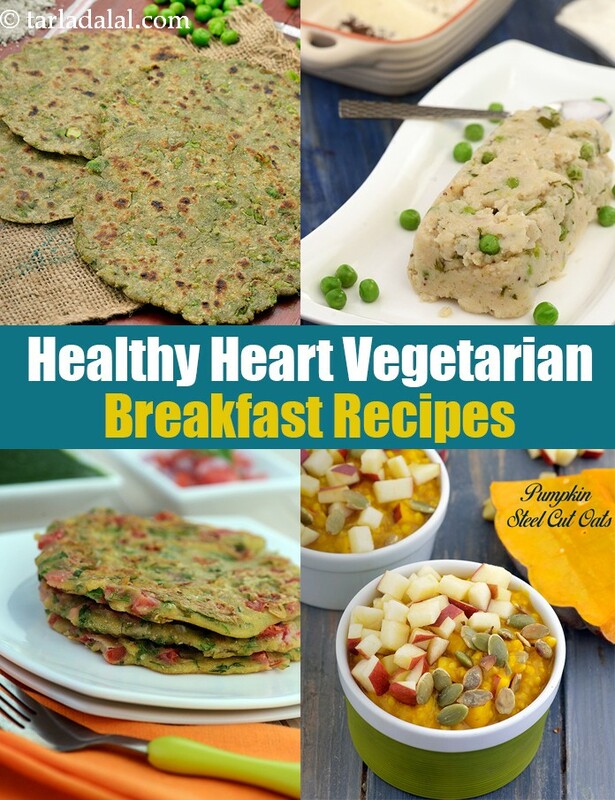 healthy heart indain breakfast recipes. Your overall diet can have a big impact on your heart health, so right from the start of the day you should be mindful of what you eat. Your breakfast should be high in fibre, low in cholesterol and fats. These heart-healthy breakfast recipes are all designed to help start your day on a perfect note. From a hearty breakfast at the table to something you can have on-the-go, from elaborate choices to those you can whip up in minutes, you are sure to find what you want. You will be amazed to see how many deliciously heart-friendly choices there are. Try making healthy rotis like the Beetroot and Sesame Roti an ideal breakfast recipe loaded with fibre and also a feast to the eyes as it has gorgeous red colour. Bajra Peas Roti can be combined with your favourite Healthy Heart Accompaniments to increase its nutritive value. Having Bajra Roti in your breakfast can top up your nutrients required for heart health like magnesium, phosphorus and zinc. These recipes are nutritious and easy to make. Innovative recipes can be prepared using oats. Traditional recipes can be made by replacing ingredients like rice, semolina etc with oats to make it heart healthy. Ever thought you could make idlis using oats? You must definitely give a try to Oats Idli a fibre rich recipe good for lowering your cholesterol levels. Strawberry Steel Cut Oats with Tea Masala is a satiating fibre rich whole grain recipe, it gets its unique peppy taste as strawberries are combined with tea masala. Apple Cinnamon and Oats is an easy to make breakfast recipe to soothe your stomach early morning, it’s loaded with nutrition being composed of dates and apples which give natural sweetness, walnuts and almond milk. Sounds tasty! Enjoy our other healthy heart breakfast recipes and healthy heart recipe articles below. Enjoy these crisp yet spongy pancakes early in the morning before starting your day. The combination of green peas with moong dal helps to enhance the fibre and protein content of this recipe. Serve hot, with carrot garlic chutney.